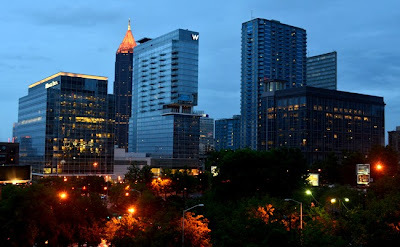 When I first moved back to Atlanta almost three years ago, I immediately started calling it "The City of Glass"...practically every building that had been erected during my nine years away was clad in glass. Glass of varying color and shape, but glass nonetheless. Fortunately for me, I really like glass buildings. Well, after exploring a while longer, I realized that the range of building materials used went considerably beyond glass. And then again, I come across a skyline view like this one, from the rooftop of a friend's downtown building, where every building in sight is glass. You should see this view when it's reflecting one of our colorful sunsets...and we have a lot of those! With developers building again, I'm quite curious to see what the next phase of Atlanta architecture will pepper our skyline. Hopefully, glass or otherwise, they're forging a number of beyond unique signature buildings! The BB&T Atlanta Open is in Full Swing!